This year’s Christmas Light festival takes place between 16 – 18 November and under the theme ‘Undiscovered Oxford’ showcases some lesser known aspects of the city. The weekend sees free festive events, musicians, dancers and choirs appearing around the city centre, unique craft workshops and informative talks, stalls offering hand-made gifts and delicious food, stunning indoor exhibitions and spectacular performances, mesmerising outdoor installations and, launching the weekend, the lantern parade through Oxford’s historic streets. Street artists, music and dance stages plus outdoor exhibitions and seasonal market with craft and street food stalls, there is plenty of entertainment for all. New and exciting light and sound installations can be found at the Westgate Oxford and Oxford Castle Quarter along with performance stages in Broad Street and Gloucester Green. Get involved in interactive and digital projects. 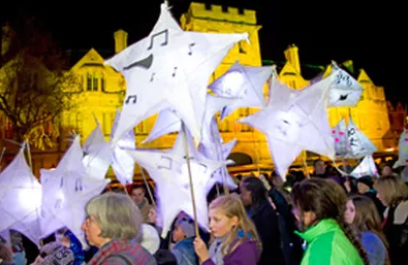 Watch the iconic lantern parade with our local young people. Well over 100 events take place over the weekend including dozens from the city’s cultural organisations. Residents and visitors can enjoy an unparalleled experience of Oxford’s streets, open spaces and buildings historical and modern. Winding its way through the streets of Oxford’s city centre, the parade will involve approximately 450 people including 300 young people from 11 schools across Oxford, 2 community groups, and 3 local bands; all led by the amazing band Mr Wilson’s Second Liners. You will find an array of spectacular lanterns designed by Paul Batten – over 300 books will be surrounded by a hot air balloon taken from Around The World in 80 Days by Jules Verne, a compass from Northern Lights by Philip Pullman, a bicycle from The Boy Who Biked The World by Alastair Humphreys, and a spectacular globe. Some of the events take place on more than one day of the Christmas Light Festival so make sure you take a good look through the list to make sure you don’t miss anything!